HF: Rob Weir started our interest in the possibility of Stonecutters Island being a site for Hong Kong airport given the dissatisfaction with Kai Tak post WW2 mainly related to its short runways and proximity to mountains. Rob found a Foreign Office file 371/53639 held at The National Archives at Kew, London, UK. The file refers to an investigation of whether Stonecutters Island would be preferable to the Ping Shan – Deep Bay site for a new airport and is dated 27th Nov 1946. (We have several articles about Ping Shan airport – see below.) Rob suggests that the reasoning behind the Stonecutters proposal was that it was within the confines of the Colony proper, important for political and strategic reasons, and not in the New Territories. The file suggests joining Stonecutters island to the mainland at Tai Kok Tsui. IDJ has found a SCMP report from March 1947. The article says that a party of “technical representatives” had concluded that it was impracticable to convert Kai Tak, and rejected Deep Bay. They recommended levelling Stonecutters Island as the most suitable solution and connecting the island to Kowloon by reclamation as Rob’s file suggested. Stonecutters was of course not developed. IDJ has sent part of RAF Wing Commander George Darley’s recollections written in 1993. As you will see below these are from October 1941 a full six years before the newspaper report above. 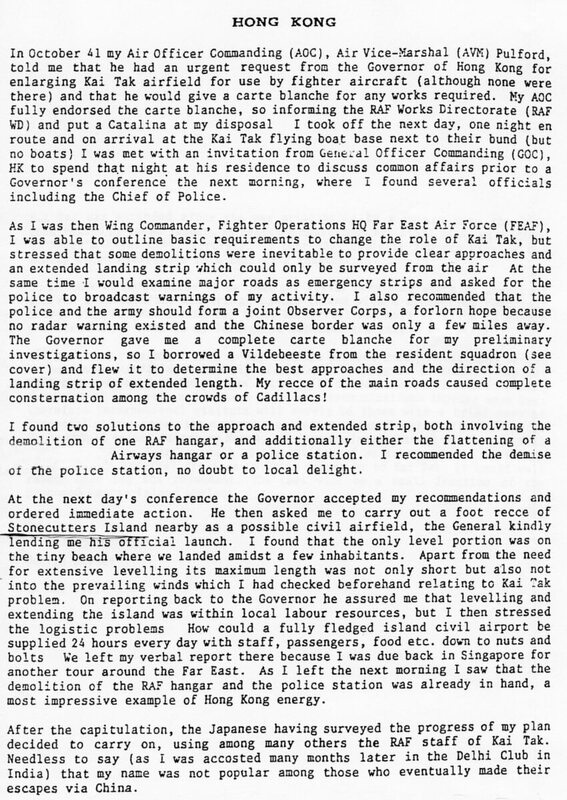 Darley was asked by the Governor of HK, Sir Mark Young, to inspect Stonecutters Island as a potential civil airfield, did so and gave a verbal report. He concludes that Stonecutters would not be a suitable location because of the extensive levelling required, the shortness of the runway, adverse prevailing winds and the logistical problems of supplying an island airport. It is curious given Darley’s damning assessment in 1941 that the island was still being considered in 1947. Several other locations which had been assessed over time were also not developed: interestingly, about fifty years before Chek Lap Kok, “Eastern” Lantau; a reclamation “inside” Kowloon Bay; a floating aerodrome! ;Kam Tin valley; Ping Shan/Deep Bay and even the north coast of Lamma Island. A plan to modify Kai Tak into a modern airport was released in 1954. By 1957, runway 13/31 had been extended to 1,664 metres (5,459 ft), while runway 7/25 remained 1,450 metres (4,760 ft) long. Lamma Island Industry – Lamma Island International Airport! We have several articles about Kai Tak – using search will locate them for you.